He could swim, but his fear of alligators kept him clinging to the overturned craft. 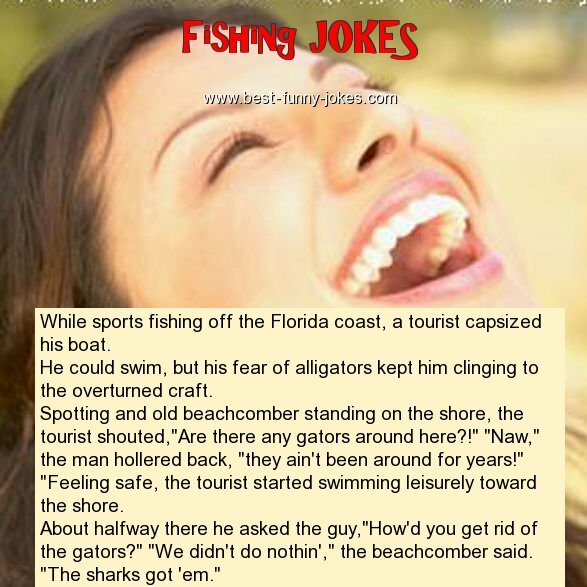 Spotting and old beachcomber standing on the shore, the tourist shouted,"Are there any gators around here?!" "Naw," the man hollered back, "they ain't been around for years!" "Feeling safe, the tourist started swimming leisurely toward the shore. About halfway there he asked the guy,"How'd you get rid of the gators?" "We didn't do nothin'," the beachcomber said.